Evgenia Epshtein, violin – "URSUS"
Evgenia Epshtein was born in Sverdlovsk (now Ekaterinburg), Russia. She began her violin studies at age of six and completed the High school for Gifted Musicians with Vladimir Milshtein. Evgenia immigrated to Israel in 1990. There she studied with Arthur Zisserman, Yair Kless and Irena Svetlova at the Tel Aviv Academy of Music and Benzion Shamir at the Rotterdam Royal Academy, where she received her Master Degree. During her studies at the Academy she won several prizes at the violin and chamber music competitions and took part in the masterclasses of Isaak Stern, Henry Mayer and Zakhar Bron. As co- founder of the “Aviv” string quartet, Evgenia Epshtein is a winner of the 3rd Melbourn International Chamber music competition ( 1999 Grand Prix and four speсial prizes), Bordaux String quartet competition (2003), Charles Hennen Music competition (1999 Netherlands). Other top prizes include “Schubert and Modernity” competition (2003 Graz, Austria, 2nd prize and special Schubert prize) and Prague spring competition (1998 2nd prize). As a member of Aviv she also proclaimed as the ” Best young ensemble” by the Culture Ministries of Germany and Israel ( 1999, 2000, 2003, 2008). 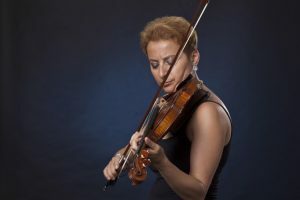 As a soloist she performed with Reconsil Sinfoniega Vienna, Bucharest philharmonic orcnestra, Zadar chamber orchestra, Split Symphony Orchestra, Ashdod and Ramat Gan Symphony Orchestra. She held recitals in all major Israeli venues and radio broadcasts. Stockholm, Paris, Toronto, Ottawa, Guadalajara, Lagos, Vienna, Zagreb, Varaždin, Split, Prague, London. Currently Evgenia Epshtein is a docent of Split academy of Arts, professor of violin and chamber music since 2011. and artistic director of Summer school ” Summer Con Spirito” in Trogir – Croatia and Winter string school ” Winter Con Spirito” in Vinkovci – Croatia. Before she taught as an assistant of violin professor Mr. Benzion Shamir at Rotterdam Royal academy. As a violinist and chamber music Evgenia is often giving masterclasses – Isa international summer academy, Prague music academy, ” Keshet eilon” violin course, France, Croatia and others.